St Patrick's day is around the corner. And everyone has the luck of the Irish for a day. This is my card for the challenge over at Artistic Inspirations. Be sure to stop by and see what our talented DT has for your green color inspirations. The image I used is from Stitchy Bear Stamps. 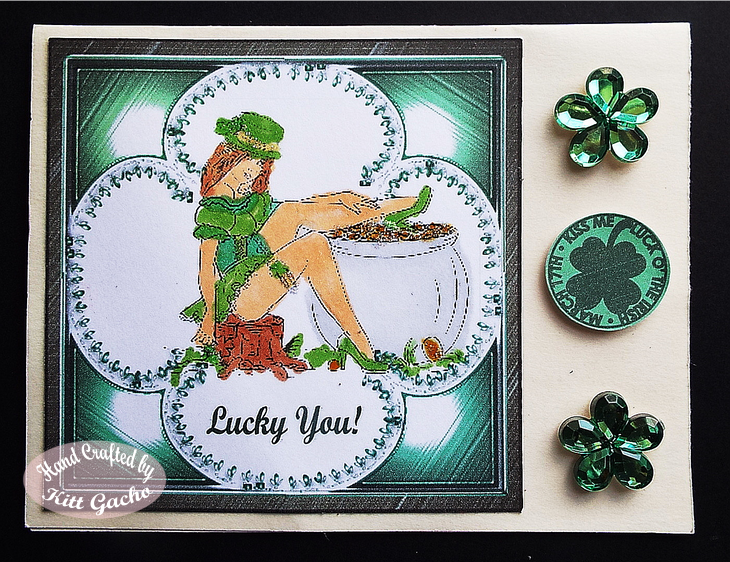 I used some green florets from my stash and the kiss me I'm Irish sticker is from the Silhouette store. I used Stickles Diamonds to add glitter to the the gold nuggets and her garter hat and shamrocks. And of course I used Spectrum Noir markers to color. LOL Thanks for stopping by today and leaving your comments. I am working on a new St. Patrick's day 3D project. Follow me along this creative journey as I will be making more 3D projects though out the year. Have a Happy Crafty Day.